CHICAGO (WLS) -- Farmers market season officially kicks off in Chicago at 11:30 a.m. Thursday at Daley Plaza. Vendors will sell fresh fruits, vegetables, plants and flowers in Daley Plaza from 7 a.m. to 3 p.m. every Thursday until October 29. 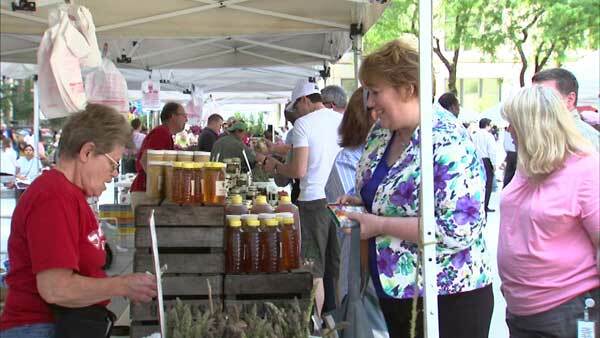 Markets at other locations will also feature music, prepared food and local artisan vendors. Check out the full list of locations, dates and times at chicagofarmersmarkets.us. The winner of the 8th annual Reusable Bag Design Contest will also be announced at Thursday's event in Daley Plaza. Chicago Public Schools students submitted designs based on the theme, "Live, Love and Be Green." The winning design will be featured on reusable bags distributed throughout the season. The winner will receive a scholarship award, the city said. This year's finalists are Christopher Duran, a senior at Mather High School; David Paredes, a junior at Mather High School; and Zhi Wei Tan, a junior at Lincoln Park High School.